Procyon-Ac is a rocky planet in the habitable zone of Procyon-A, about 2AU from its star (an F5IV white subgiant). Its oceans are home to cyanobacteria which have given the world an oxygen atmosphere, but there are no higher forms of native life. The world is just emerging from a desert phase, caused by the Procyon-B’s expansion into a red giant. That star has now shed most of its mass, and is a hot white dwarf. Continuing comet impacts have replenished Procyon-Ac’s water oceans. Planetologists expect this process to continue, so that the planet will become a water world within the next 100 million years. Humans have seeded the world with Earth species, which have taken vigorous hold on land. Human settlements tend to be built in mature woodland, in order to shade them from harmful UV-A radiation. Since the fall of Earth to the totalitarian Esperanzan Commonwealth, Procyon has become the last bastion of freedom in the Core Worlds. The Commonwealth has blockaded Procyon, cutting off its supply of antimatter. The routes through Esperanza and Corridor are out of the question, but the Earth Union fleet is also blockading Epsilon Eridani. 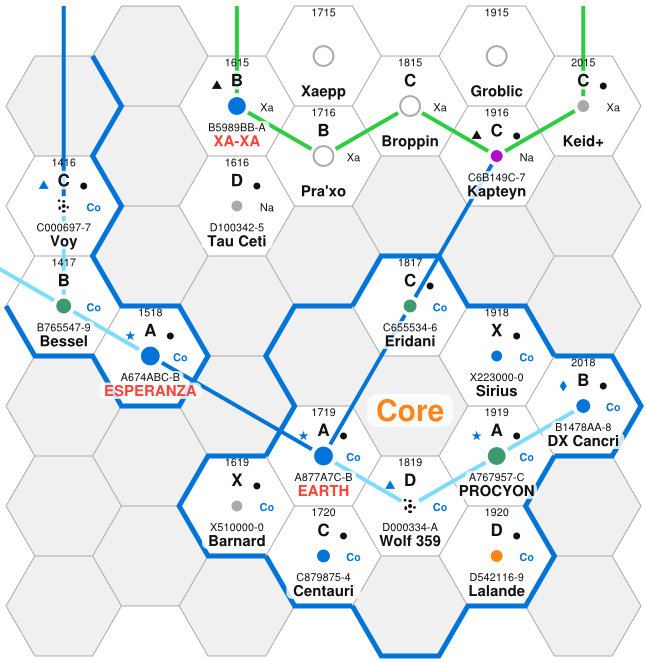 Procyon’s traders’ only option is to jump via Sirius to Kapteyn, where they must deal with the historically hostile Xa Imperium. A stream of refugees from Earth and the Belt have arrived. Some of them have brought great wealth, knowledge or resources with them, but most arrived with nothing. These refugees have been housed in cramped tent-cities – for many of them, movement is strictly limited – there have been disturbances, and tensions are on the rise. The arrival of millions of Uploads has placed further strain on Procyon’s economy. The Uploads’ data centres require vast amounts of power to operate, and power is in short supply. Without antimatter, the world has been forced to fall back on fusion generators, which produce orders of magnitude less energy. Without the power to run them, many Uploads remain in storage. Most corporations are members of the Procyon Defence Alliance (PDA), which operates a fleet of monitors and system defence boats, and coordinates a rag tag assembly of corporate warships and ships that have defected from the Earth Union Fleet. The PDA also operates a significant missile PD network, and is currently building out a fleet of robot battle stations. Procyon is subject to fairly frequent asteroid and comet impacts. There is a well-established early warning and impact deflection system. Kevin Simpson Is this a game? Or some creative fiction? Not sure what I’m looking at. Tony Jones Beats leaving them uncontrolled to go smashing into your planet! Quinton Carroll Who mentioned smashing asteroids into planets? Alexander Tingle Quin seems to have a “thing” about smashing asteroids into planets. Quinton Carroll Not me guv.